Installing and Running Linux on Sony PlayStation 3 (PS3): It is possible to install and run Linux on the Sony PlayStation 3 (PS3) video game console (not-including the PS3 Slim model). In fact, there are plenty of distros that are compatible with the PS3 such as Fedora, Ubuntu, openSUSE, Yellow Dog, and Gentoo. 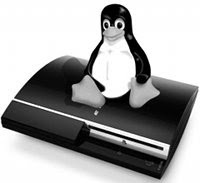 The Linux kernel supports PlayStation 3 since version 2.6.21, that means no patches or hacks are required to install and run a full-featured distro. The XrossMediaBar (XMB) menu of the PS3 allows users to optionally install other operating systems making it possible for Linux to boot from the hard drive, USB, or from a LiveCD. Yellow Dog Linux is perhaps the most widely used distro for the PlayStation 3. If installed on PS3, you can enjoy its many included applications like OpenOffice.org, Firefox, Rhythmbox, Evolution, Pidgin, GIMP, MPlayer, and many others. The basic requirements for installing Linux on the PS3 are USB keyboard and mouse, Linux distro (supported) installer CD/DVD, USB drive (for backup), and PlayStation 3 video game console (duh!). To install a Linux distro on the PS3, here are the steps needed. Step-1: Backup all your saved data to the USB drive just in case something bad happens. Step-2: From the XMB menu, navigate to System --> Format Drive --> PS3 HDD. Step-3: Then, select a partition for the hard drive by going to Custom --> Allot 10GB to the PS3 System. The PS3 should restart after this. Step-4: Login and insert your Linux CD/DVD installer. Step-5: Again from the XMB menu, go to "System" and then "Install Other OS". The PS3 will search for otheros.bid from the installer. Once found, install it. Step-6: After the installation, you can now set the PS3 to boot Linux by default by navigating to System --> Default System --> Other OS. Congratulations! Your PS3 is now running a complete Linux operating system that turns it into an awesome personal computer. You probably failed to mention, and it is very important. They say it's aching slow running these linux systems in PS3 as they're allowed only 256MB of memory once installed. You can't really take advantage of the high processing power of the PS3. But even with a big PS3, running in an hypervisor is not interesting... moreover, you cannot access directly the RSX GPU. It's a kind of fake GNU/Linux support. It's a shame because full access to such hardware would have pushed geeks to reverse engineer the RSX (nv40 based) PS3 GPU. If I could install Gnu/Linux on a PS3 with proper support I would buy it in the blink of an eye.